On mornings when I open the café, I walk about fifteen minutes down Kingsway towards its awkward intersection with Main. While not very scenic – all cars and car dealerships – it is the most direct route. Things improve as I cross 12th Avenue, where on clear mornings I see the sun reflected off the skyscrapers downtown, and the mountains looming behind them. The buildings look like they’re on fire. As I continue downhill, I can spot the Broadway intersection and the flock of pigeons that make its southwest corner their hangout. Some mornings I get to admire them stretching their wings, tracing arcs in the air with that unison particular to flying animals. Other days I might catch them in the middle of a turf war with a few seagulls, the outnumbered party raising their wings and screeching like entitled assholes. Most days, however, I just see them perched on the power line above me, maybe admiring the view. Considering the state of the sidewalk underneath, it’s some wonder I’ve never been shat on here. Now and then I idly wonder where these pigeons will be in two years’ time. Will they, stubborn creatures, continue to loiter in front of what will then be a row of low-rise townhouses? Or will they relocate to the corner of 10th and Watson, to what will then be one of Vancouver’s largest private parks? Or perhaps they will want the grandest view around and nestle themselves on top of the Independent’s 21-storey tower. Will residents put up with this unwanted encroachment on their property? I mean, shitting on the pets is one thing – thank goodness for the on-site dog spa – but those dry cleaning bills add up. Living in a city is about uneasy community. It is only a matter of time before some are made to feel unwelcome. If anything, the way the city has handled Rize’s rezoning of 285 East 10th has only underscored how beyond our control this whole phenomenon is. The Residents Association of Mount Pleasant has been on the developer’s case since this project’s inception five years ago, even filing a suit against the City of Vancouver last August over its final plan, which was upscaled from what council approved in 2012. Nevertheless, the city granted final approval on November 25th of 2014, allowing construction of a building that nobody I’ve spoken to in the community wants. I suppose we shouldn’t be too surprised. It might be useful to take a look at successful neighbourhood movements of Vancouver’s past, such as the stands taken in the 1960s and 70s against Project 200 in Gastown, as well as the Chinatown Freeway. In the end these successes have been followed by such dramatic upscaling in property values that increasingly-disenfranchised residents can no longer afford what they sought to preserve. It is not clear that groups like RAMP in Mount Pleasant have learned from this history, and their critique of the Rize development often doesn’t even take affordability into account. Instead they contend that the condo is out of character with the neighbourhood. The failure to address what “character” and “preservation” even mean, as entrenched residents increasingly find they can no longer afford rent in their neighborhood, only underscores how the fight against gentrification means little when it’s stuck inside of a middle class vacuum. The situation today is complicated by Vancouver’s desirability on the world stage which, along with a peculiar host of political and environmental factors, has led to a system of urban planning favouring those developers with the most money to throw around (CACs, anyone?). As all its residents hopefully recognize, corporate interests are increasingly superseding community interests in Mount Pleasant. What is especially pernicious about this trend is the way in which developers such as Rize try to disguise their private aims as the voice of the community, placing themselves in some projected harmony with the neighbourhood. The consequence is a selective vision of a community, a paper-thin simulacrum that presents only those aspects of a neighbourhood that developers deem marketable while wilfully omitting everything else. This rhetoric has been especially strong with Rize’s marketing of the Independent, and I feel this needs closer scrutiny. What better place to start than with the development’s aggravating name? The Independent. An adjective made noun with a definite article, it stands alone not just in light of the word’s meaning but in its semantic structure. It embodies a built space at the same time it embodies a lifestyle. Tossing all subtlety out the window, it condescends to you in equating a space with some whitewashed version of bohemianism. It is a name that digs its heels into cultural anxieties over distinguishing oneself from the masses, and slaps you in the face with its promise to make you stick out. The slogans that surrounded the showroom’s construction site up until recently left no room for confusion: “Stand apart and stand for something”; “Be unique and embrace individuality”; “Embrace passion, soul, craft and craftsmanship.” Who knew that the soul could be bought at $500 per square foot? By choosing a name in a definite and singular voice, Rize also sets up the imaginary risk of imitators, colonizing a state of being prized by capitalist society and creative individuals alike. In our postmodern world these two groups have more in common than you might think. As David Ley has articulated in his study of gentrification in Canadian cities, the phenomenon has been spurred on from the very beginning by a fetishizing of alternative and artistic lifestyles, which is perceived as an antidote to the conformity of mass culture. In this new market, the “artist serves a social role as a broker of fashionable middle-class taste, demarcating the new frontiers of cultural distinction.” So to oversimplify, artists move in, imbue a place with cultural cache, and then developers follow suit, selling the promise of a unique lifestyle achieved through stylish consumption – the artistic made artisanal. Mount Pleasant has a strong community of artists; studios and galleries dot the warehouse district around Main Street. Many of these artists congregate at my café, and a great many more of them keep themselves afloat in the service industry. Based on the 2011 Labour Force Survey, Canadian artists on average earn wages 39% below the combined national average, and that only accounts for those who spend more hours on their art than at other jobs. The reality for most artists, in other words, is less than romantic, and it is no great stretch to assume that the vast majority in this neighbourhood – stuck between increasing rents for living and studio spaces – couldn’t afford buying property even if they wanted to. One of the conditions of Rize receiving their zoning permit was to contribute $6.25 million to some of Mount Pleasant’s local arts organizations. It is almost too bitterly appropriate that the largest contribution went to VIVO, a video archive and gallery space that was recently evicted out of the neighbourhood. Though Rize may have aligned themselves with sections of the local arts community, we must ask ourselves if this model of one-off donations from corporate developers is even sustainable and, deeper still, what it spells for the role of art in the market. This map finds a companion piece in Rize’s minute-long commercial for the Independent. I was first subjected to this while out at a movie in Kits and, if I’m being totally honest, it was what incensed me to write this article in the first place. Open to a long shot moving down the middle of an upscale residential street, all parked cars and no people, and the phrase “The centre of the city just shifted” flashes front and centre. The camera is pulling away from this quiet scene, out of reach, out of fashion and anyways out of budget. So never mind the suburbs. Cut to various shots of Main Street’s cafes and bike shops opening for business. It’s a new day in hipster paradise, so time to meet the locals. Young attractive people in various configurations of ethnicity jog, play basketball and interact around their tablets to an indie rock soundtrack. Like the setting of Logan’s Run, the neighbourhood is curiously absent of old people, though at the same time no one’s pushing a stroller around. Instead, free of burden, the young and beautiful bike, shop, caffeinate and stuff their faces. They all seem to have an awful lot of free time. These are intercut with shots of people working, but working the sorts of jobs that don’t translate to owning property. By simple juxtaposition, these workers in effect become the underclass, your able and underpaid servants here to furnish your hip urban leisure. As the commercial progresses, some of Mount Pleasant’s local signifiers flash on screen, reminding viewers that this isn’t just any other gentrified part of Vancouver. The final shot centres on the face of a young girl, the only child in the entire commercial. Maybe she signifies the family you’ll raise in your new condo. Or maybe she personifies Rize’s vision of Mount Pleasant: beautiful, well-groomed, young, full of promise, and white. So much for what this vision includes. What about its glaring absences? Missing is the Mount Pleasant Community Centre, home to the neighbourhood’s public library branch, child care facilities and a food bank. Missing is the Kingsgate Mall, the decidedly un-boutique shopping centre across the street that’s on the table for redevelopment. Missing are Our Town and Reno’s, two of the closest restaurants to the Independent, but whose mixed crowds and homey aesthetics must not fit into Rize’s vision. Missing are the arts spaces that received CAC funding, or any other arts spaces, really. Missing is any indication that the development stands along the busiest transit route in North America, the sardine can B-Line which in its current state could not possibly accommodate any more density. Missing are any grocery stores for those who can’t shop at Whole Foods or Granville Island. Missing are the homeless people panhandling outside of Tim Horton’s or under the cover of the Lee Building. Missing, in other words, is any evidence that Mount Pleasant isn’t the strict domain of the young and financially stable. In public hearings over the rezoning three years ago, Ivan Drury of the Downtown Eastside Neighbourhood Council speculated that, after the DTES, Mount Pleasant has the highest concentration of low-income and aboriginal people in Vancouver. A 2008 report by PIVOT fleshes out this soberer picture, finding that about 70% of North Mount Pleasant’s population are renters, and more than half among them first and second generation immigrants. What we are presented with in Rize’s vision is Vancouver as a postmodern capitalist utopia, but one that exposes its dystopian underbelly, whitewashed as it is of the old, the struggling, the newly immigrated, the destitute and all of the less marketable realities of city living. Even the pigeons are missing! My genuine worry is that, if this false consciousness is perpetuated for long enough, it will continue to foment the attitudes and circumstances that make this vision a reality. I have a personal stake in this, after all: I’m one of the people keeping this neighbourhood caffeinated, and I’ll be expected to know my place. Just don’t expect your white porcelain cup to be pristine. A thorough account of the movement against the Chinatown Freeway, as well as the city’s wilful deafness towards Strathcona’s Chinese residents up until then, can be found in chapter 4 of Shlomo Hasson and David Ley’s Neighbourhood Organizations and the Welfare State (Toronto: University of Toronto Press, 1994). Ley, David. The New Middle Class and the Remaking of the Central City (New York: Oxford University Press, 1996), 189. Hill Strategies Research Inc. A Statistical Profile of Artists and Cultural Workers in Canada. Retrieved fromhttps://owl.english.purdue.edu/owl/resource/560/10/. 2014. Karyn Mesa Calvez and Eerik Ilves. Cultural Divide: A neighbourhood study of immigrant rental housing in Vancouver (Vancouver: PIVOT/Mosaic, 2008). Posted in Gentrification, Housing, Mount Pleasant. Bookmark the permalink. This is the epitome of pretentiousness. In the first paragraph, do you mean “awkward intersection with Fraser”? You’re poor, get over yourself! Some moderation would be useful to clear away sh*tposting like this. You say the community doesn’t want it because you’ve talked to a few people, but Rennie (the group selling it) confirmed that 60% of purchasers came from the surrounding mount pleasant postal codes (I live here and bought one for myself as did many of my Mt.Pleasant clients), and almost all came from somewhere in Vancouver… They also report that 80% sold within the first month… the data seems to suggest different than your few conversations. I’m also curious if your coffee shop has ever used homeless people, pidgeons, or food banks in your advertising or promotions? I don’t want to make assumptions as you have but I expect that if they had of included more of this then you would just say they were exploiting them… I don’t believe the “capitalist” (as you call them) can win with you. p.s. I also assume that despite your comments about the full B-line buses, you are not voting YES to the transit referendum and are instead waiting for a more utopic plan. 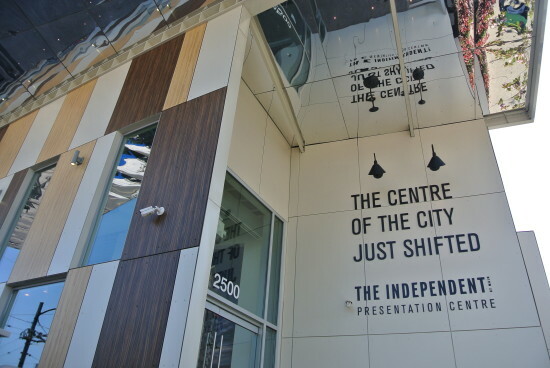 I am not disputing that there is a real desire for owning property within Mount Pleasant , and that condos such as the Independent are about as accessible as you can get for prospective buyers (hence it selling out so quickly). I will also admit that my conversations were with a certain cut of the community: indebted students, others in the service industry, local merchants and artists – people who for the most part are disqualified from buying in this city anyway. My main issue is with how the Independent’s marketing campaign isn’t really selling condos so much as it’s selling a cherry-picked version of Mount Pleasant itself, and an attendant lifestyle that confuses stylish consumption with authentic fulfillment. I get that this is nothing new in the world of advertising, and that lies are routinely packaged as reality, but that doesn’t make it okay, especially when the product is a neighbourhood erased of its diversity. For that reason, I think the comparison you make with my cafe’s advertising isn’t entirely fair, since we’re not claiming to sell anything other than strong coffee and croissants (though for what it’s worth: our last magazine ad was a photo of my boss’ toilet-trained cat using the facilities). It’s difficult not to imagine this condo as a vertical gated community when its developer betrays this much willful blindness. And this doesn’t even take into account how developments like these affect local amenities and, in turn, rent prices. The idea that this marketing campaign could become a self-fulfilling prophecy, to me, is deeply disturbing. I’m curious: did you buy a unit to live in yourself or are you leasing it out? And if you’re leasing it, how much will you be charging for rent? P.S. if you must know, I don’t believe in utopian plans, and with some hesitation I voted YES. Well said, Andrei. You’ve written an engaging and thoughtful piece that does a convincing job of exposing the multiple ironies. There are many Vancouverites nauseated by the cynicism of the lifestyle packaging associated with these condo developments and their developers (and their City Hall backers). I was also struck by the bald-faced nature of The Independent’s pitch. “Stand apart and stand for something” — by being a diligent member of the consumer herd? “Be unique and embrace individuality” — by purchasing a concrete box with a floorplan undifferentiated from the ten of thousands of other concrete boxes being fabricated during this real estate gold rush? The discontinued blog, condohype, would have had a merry time eviscerating The Independent. Boutique developments for the uber-wealthy aside, successful development in Vancouver is about mass production and mass marketing. The surest way of appealing to the masses is to make individual members feel they aren’t part of the herd. If enough of them/us fall for it, you achieve your goals. And it doesn’t matter if 10% or 20% of the community sees the rampant manipulation. The built environment of this city is being replaced. There is some grassroots resistance to the process but I think the most it will achieve is to nudge the path of the boulder as it rolls through. The question I have, and I think the answer is fairly evident: If you replace the built environment does it necessitate replacing the people? Thank you for writing this. This development seems to distill everything vomit-inducing about culture used for gentrification. The first time I read those slogans, I reread them 7 times in disbelief–like they seem TOO obviously manipulative–like, they appeared ironic the first couple of times I read them (as in, there is no way they’d expect anyone to read those slogans as sincere proposals, is there? )–then they seemed to be sarcastic, and then cynical… I noticed for example that what would be the phrase “Stand UP for something”–stand up for those who are disempowered, stand up against systemic oppression–in The Independent’s marketing becomes abstract, merely symbolic: “Stand for something”–*stand in* for anything… how “Standing together with one another” becomes “standing apart”… And while the notion of craft is not necessarily political in every instance of the term’s use, this marketing does borrow from the term “craft” its cultural weight–which *is* amassed historically as a result of craft’s politicization as an activity in resistance to industrialism–while displacing its political connotations–that is, “craft living” is not meant to be a critical way of living, of collectively constructing our society, but, in a so-called post-industrial context, is sold as a way of “improving oneself” by disposing society altogether. How is it that “passion” and “soul” has become something independent individuals do, instead of something shared across difference? ! So incredibly on point; the commodification of lifestyle hollows out grassroots culture. I love this article so much. Andrei, you clearly have your finger on the pulse. Bravo! 1) Mount Pleasant is already very gentrified; newer developments like the Sophia, Stella, 1 Kingsway, Social, District, and Collection 45 have already had a massive impact, to say nothing of many smaller-scale developments and renovations. It’s doubtful that preventing the Independent would do much to reverse a trend that’s long since transformed the neighbourhood. 2) The gentrification of Mount Pleasant has been encouraged by land use policy and politics in more affluent parts of Vancouver. When it’s politically impossible* to build anything other than detached housing in most wealthy neighbourhoods, it’s sad but not surprising that development is instead diverted to less politically connected areas. 3) The alternatives to building near crowded transit routes is building in car-dependent areas or not building at all. I’m willing to accept additional crowding in the short term to avoid even worse outcomes. *Really. Over 60% of Vancouver’s land is zoned for detached houses, other uses (retail, offices, industry, agriculture, and multifamily housing) get the remainder. This is not likely to change anytime soon. Excellent article! Well written and thoughtful. Will the IIO Give One Minute for Du Na Phuong?